I think many would agree with me that it's a damned shame that the boys in Nevermore can't work things out and just get on with it. With so much amazing music behind them, it just seems wrong not to split up this way. Yeah, yeah, I know that Dane and Shephard go on with a new line up, but it's NOT the same. Anyway, it's great to hear that there is also a life of shredding for Jeff Loomis outside Nevermore. His first solo album will be out in a few days and it's certainly worth picking up from your local dealer or download place or whatever you do. If you're just looking for Nevermore without Warrel Dane, you'll be disappointed; there's more to Jeff than his past band! Yes, you can hear that this guitarist was part of one the coolest thrash bands of later years, but actually in fewer instances than you'd probably expect. First and foremost, there's SHRED en masse on 'Plains of Oblivion', and a bit more Yngwie, in fact, than I'd anticipated, and a touch of Satriani too - but it's GOOD! It's also a diverse album without Loomis ever falling into the trap of making it a chaotic mess of habhazard fretboard gymnastics. There is always structure and an underlying quest for power and brutality which I suppose is where this is most similar to Nevermore. 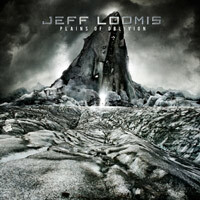 Surprisingly, Loomis has decided to included vocals on three songs, two of which with female vocals (by Christine Rhoades) and Ihsahn (Emperor)(!) The tune Tragedy and Harmony with Rhoades comes across as a pop songput on top of powerful shredding. The other song with Rhoades, Chosen Time, is more pop, but with a solid and warm foundation of guitar. The inclusion of Ihsahn was one I hadn't seen coming at all, but, hey, it works and certainly adds some extremity to 'Plains of Oblivion'. What isn't surprising in any way is that Jeff has invited various fellow shredders to join him. Marty Friedman, Chris Polan (both formerly of Megadeth), Tony MacAlpine and Attila Vörös (Nevermore) all have thrown in some riffs. For fans of heavy guitar music, this album is one of this year's most-buys, no doubt about it. Shred, crunch, groove and power, this one has it all!